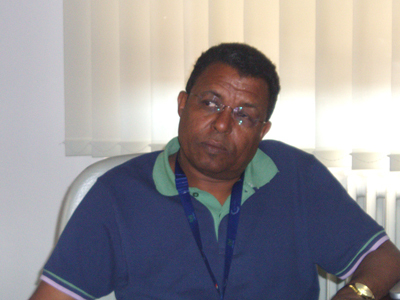 From 4 to 14 July 2011, Tesfaalem Tekleghiorghi Sebhatu is the Institute's guest in Teramo as part of a World Organisation for Animal Health (OIE) twinning project between the G. Caporale Institute and the National Animal and Plant Health Laboratory of Asmara, Eritrea. The purpose of the visit by the head of the Eritrean national laboratory was to discuss with the Institute's staff future scientific cooperation between the two research institutes, especially in the field of tropical diseases and zoonoses, such as brucellosis and tuberculosis. Relations between Italy and Eritrea date back to the early 20th century, when the very first veterinary laboratory in Africa was founded by the Italians in Asmara. In 2005 the G. Caporale Institute was asked to provide support to the Eritrean National Programme for the control of brucellosis and tuberculosis in the Barentu region, near the border with Sudan. Between 2006 and 2008, this first contact led to a cooperation project funded by the Abruzzo Regional Council, followed by the OIE Brucella twinning project and the ongoing research project "Experimental infection study of ovine rinderpest and sheep pox", which will enable the Institute to acquire new knowledge of tropical diseases at risk of being introduced into Italy.